EDGE is a consulting boutique dedicated to educational excellence for all. 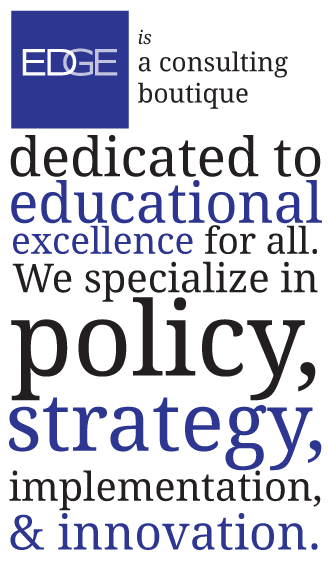 We specialize in policy, strategy, implementation, and continuous improvement. As the principal in charge of strategy and policy, Jim brings more than four decades of experience in education leadership to the EDGE team. Over the course of his career in government and in the private sector, he has engaged in key initiatives in public policy, advocacy, research and development, curriculum and instruction, and marketing. As the principal in charge of operations, Ruth has more than 30 years of experience in the Washington area as a lobbyist, homemaker, civic activist, and investment manager. Her organizational acumen provides a strong administrative and operational foundation for EDGE. Posted by Kohlmoos on Nov 11, 2017 in The EDGEucator | Comments Off on Craig Wacker, an EDGE Strategic Partner! Posted by Kohlmoos on Apr 22, 2017 in The EDGEucator | Comments Off on What Would Einstein Think? Posted by Kohlmoos on Apr 19, 2017 in The EDGEucator | Comments Off on Great suggestions by a great teacher! Posted by Kohlmoos on Mar 12, 2017 in The EDGEucator | Comments Off on Start with Public Education, Says the Nellie Mae Education Foundation!